As a pastry chef, I was taught to always create garnishes that reflect the flavors of the dessert I was making. As a cake designer, I never do that. Ever. Hardly ever, at least. Definitely not enough. It’s a strange disconnect between two careers that seemingly have so much in common. Soon after my love affair with chocolate flowers began, I decided to make it a personal goal of mine to find more ways to bring delicious, flavorful elements into my decorating repertoire. That brings us to confetti! 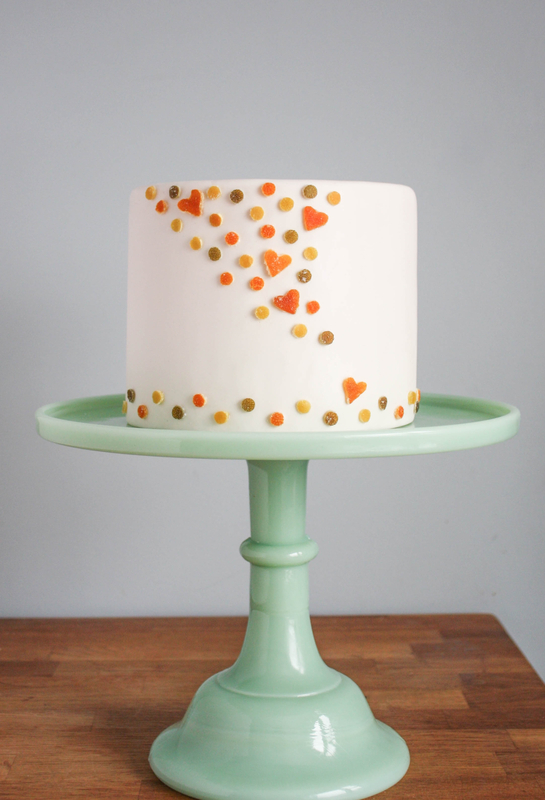 A current favorite trend across all types of design, cakes included. I’ve done gorgeous, un-paletable gold confetti. Tasty, super sweet, shredded candy confetti. 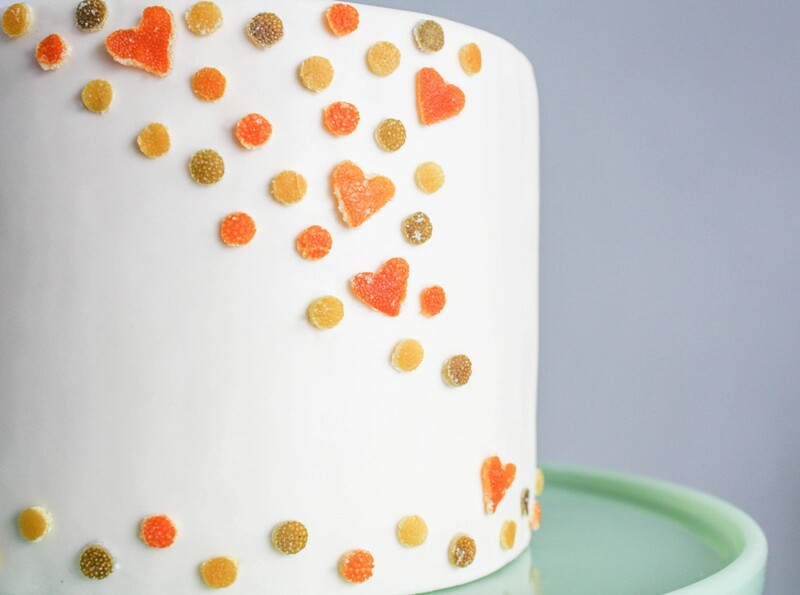 And now, sweet, tart, chewy, and all natural edible confetti made with candied citrus. I made circles and hearts, but you can make any shape you like. Bonus side effect of these edible decor experiments? More recipes! 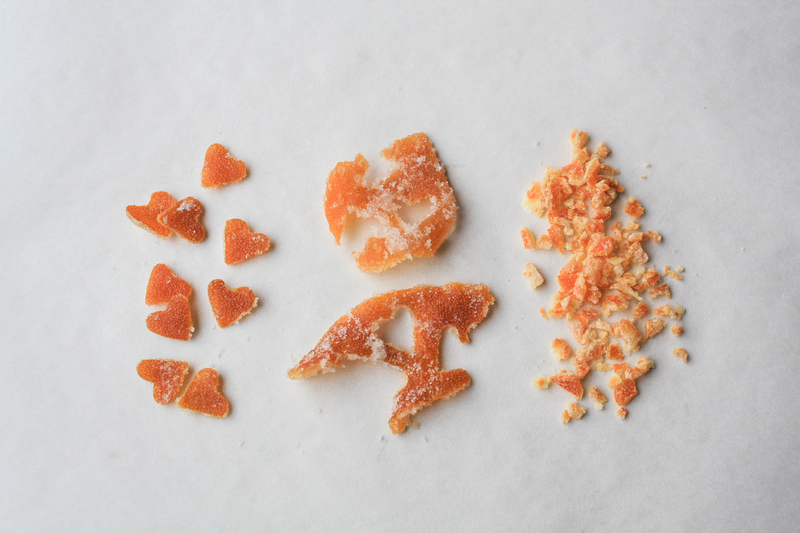 Later this week I’ll share what I made with my naked citrus and candied scraps. Remove the peels in 1 1/2-inch wide segments (including the white piths) from each of the citrus fruits. It’s ok if a small amount of translucent white remains. Reserve the naked fruits for another recipe. Place all of the peels into a small sauce pot and add enough cold water to cover by about an inch. Bring to a boil and simmer for 10 minutes, then drain. Repeat this process two more times. This helps remove any bitterness from the peels. Blanching the peels together saves time and doesn’t affect the final product. However, you will need to separate the peels by type before moving onto the next step. Rinse the peels under cool water, long enough so that you’re able to handle them. Cut out your desired shapes using the small heart cutter or pastry tip. The peels should be very soft at this point and easy to cut. Don’t toss those scraps! We’re going to candy those too and use them in another recipe (or just keep them around to snack on). Remove the citrus peel confetti and scraps from the syrup using a slotted spoon or small strainer. Reserve the syrup to flavor teas or cocktails, or to use as as cake-soak. Syrups will last up to 3 months stored in the fridge. Toss the candied citrus confetti and scraps in sugar. Spread the coated peels onto a piece of parchment paper and allow to dry out for at least 4 hours, up to overnight. The shapes and scraps will be much easier to separate once they’re coated in sugar. I combined my dried confetti pieces into one container, and separated my lemon, lime, and orange scraps into separate containers. Leave your scraps whole, or finely chop before storing. Sprinkle confetti to onto a freshly iced cake or cupcakes; or attach to a fondant covered cake using a bit of jam or piping gel. While this is kind of a time consuming process, the reward is that the candied citrus confetti and scraps will last in airtight containers at room temperature for up to three months. Plenty of time to find plenty of uses for these beautiful little treats! *You’ll see me use Lyle’s as my go-to sugar syrup because of it’s wonderful caramel flavor and thick consistency. I’ve been using it for years now and have not met a recipe where it didn’t work as a superior swap for corn syrup. (I may or may not be known to enjoy a spoon of it on its own from time to time.) It’s available at most supermarkets in my area. If it’s not available in your area, plain corn syrup will do. Give Lyle’s a try once and you’ll never look back. And for those who have asked, here’s where to find the Jadeite 9″ Glass Cake Stand – Made in the USA By Mosser Glass .